I am excited to have been invited by the Great Falls Group of the Sierra Club to join in the “Clean Energy Financing Workshop for Local Governments” that will be held this Friday (September 7) from noon to 1:30 p.m. at the Fairfax County Government Center. I’ll be talking about one of our favorite topics: solar power purchase agreements (SPPA), an accessible way for financing renewable energy projects that local governments can use. This brown bag lunch event is free, but registration is required as space is limited. If you can’t make it on Friday, I understand you can register as a virtual attendee and get access to the video after the session. Maybe I will see you there. If we miss each other, I can answer any questions about this topic or renewable energy development here, or just contact one of our renewable energy lawyers. Maryland’s Community Solar Pilot Program is moving along with dozens of solar facilities in the project queues for Baltimore Gas and Electric Company, Pepco MD, Delmarva Power MD, and Potomac Edison Company. The first year of the program has seen strong interest from the Subscriber Organizations that develop and manage the solar facilities. Under the program, customers subscribe to a portion of the output of the community solar facilities, which are called Community Solar Energy Generating Systems. Many of the solar projects entered the utilities’ production queues last summer, so they will be reaching the operational deadline under the program rules in the next few weeks, unless they request an additional six months. Several Subscriber Organizations have recently filed requests with the Maryland Public Service Commission for extensions, citing permitting delays, program delays, and other implementation challenges. The program is a great opportunity for electricity customers – including low- and moderate income residents – to access solar energy, particularly those that rent or do not have the ability to install their own solar panels. Under the pilot program, if a community solar facility is located within your utility’s service territory, even if it is across town, you can enroll with a Subscriber Organization and purchase a portion of the energy produced by your community solar system. While subscribed to a solar facility, customers receive a bill credit each month for energy generated by the solar system. Offers from Subscriber Organizations include discounts off the utility’s standard electric rates from around 5%-10%. Customers won’t actually get their household energy directly from solar panels, but their payments will help finance solar facilities that place electricity onto the grid. So far, the Commission has approved six projects across Maryland and we anticipate that more will be approved within the next few years. Statewide, the General Assembly authorized bout 200 MWs to be built under the pilot program which could power about 40,000 households. As with any new program, some implementation challenges are to be expected as the program gets off the ground. However, we are optimistic that Maryland’s Community Solar Pilot Program will be a success, enabling more and more customers are able to access solar energy. If you would like more information about the program’s background, we have been tracking the Maryland’s Community Solar Pilot Program since its inception and the development of the program regulations back in April of 2016 (check out our previous post here). We also did a video about Community Solar in the mid-Atlantic region last Spring. If you have questions or would like more information about community solar projects or other regulatory issues, contact Eric Wallace or any of our mid-Atlantic energy lawyers. Renewable energy development, driven by rising corporate demand, was a central theme of Wednesday’s 2018 Virginia Energy Conference, hosted by the Virginia Chamber of Commerce. Garret Bean, Vice President of Development for sPower and one of the keynote speakers at the conference, discussed his company’s proposed 500-megawatt facility in Spotsylvania County, which will serve corporate customers in Virginia. Microsoft announced that it will purchase 315 MW of energy from sPower’s 500 MW project as part of its sustainability goal of 60 percent renewable energy by early 2020. In addition to Microsoft, major global companies including Google, Apple, Facebook, and Walmart have joined together to commit to 100% renewable power as a part of the RE100 initiative. In his keynote, Bean explained that rapid data center development in Virginia, sustaining 70 percent of the world’s internet traffic, coupled with customer demand for cloud services powered by clean energy sources, presents a significant opportunity for growth in Virginia’s renewable energy sector. 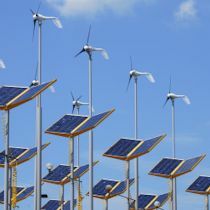 However, with the growth of renewable energy, developers are facing siting, permitting, and interconnection challenges that will have to be overcome. Delegate Terry Kilgore, Senator Frank Wagner, and Secretary of Natural Resources Matt Strickler also discussed the opportunities and challenges of Virginia’s renewable energy industry. Senator Wagner voiced concerns about Virginia’s proposed regulations to link to the Regional Greenhouse Gas Initiative (RGGI) and participate in its regional greenhouse gas emissions cap-and-trade program. 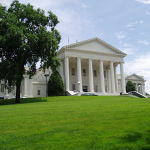 However, with the passage of SB 966 this session, paving the way for 5,000 megawatts of solar and wind energy in Virginia, and Governor Northam’s announcement that the Virginia Department of Mines, Minerals and Energy has posted a Request for Proposals for contracts to help strengthen Virginia’s offshore wind supply chain and service industry, the future for Virginia’s renewable energy industry is looking bright. If you have questions about Virginia’s renewable energy industry, legislation, or regulatory structure, please contact one of GreeneHurlocker’s energy and regulatory lawyers. On May 1, Dominion Energy Virginia (“Dominion”) filed its 2018 Integrated Resource Plan (“IRP”) at the State Corporation Commission (“SCC”). In Virginia, an IRP is a utility’s proposal for meeting customer demand over the next 15 years. An IRP is a planning document and does not represent a commitment to pursue any particular course of action. Instead, it is the utility’s best assessment, at a particular point in time, regarding which resources it will deploy over the planning horizon. The SCC must review Dominion’s IRP and decide whether the plan is “reasonable and in the public interest.” Generally, interested parties are able to present arguments and testimony regarding the reasonableness of the plan. Dominion’s 2018 filing includes five alternative scenarios. The key variable in the alternative plans is carbon regulation. For example, the IRP includes different modeling based on whether a carbon tax is imposed at the federal or state level, or whether the Commonwealth joins the Regional Greenhouse Gas Initiative. 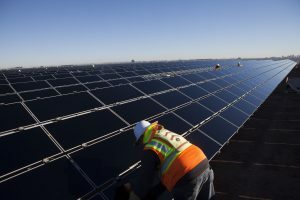 In each alternative plan, Dominion proposes to add at least 4,700 MW of new solar capacity in the next 15 years. Dominion also proposes to add between 3,700 and 5,200 MW of new gas-fired generation. Dominion suggests that these new gas facilities will be used as “peaking resources,” which run when necessary during periods of increased demand, such as on hot summer days when there is greater need for air conditioning. The also IRP assumes that Dominion’s peak demand will increase 1.4% each year. The IRP indicates that the proposed Atlantic Coast Pipeline (“ACP”) will be a supply source for the new gas facilities. Dominion states that it has already signed an agreement to “secure firm transportation services on the Atlantic Coast Pipeline.” Dominion’s parent company, Dominion Energy, is one of the developers of the ACP. Finally, the IRP assumes that Dominion’s four nuclear reactors will receive federal approval to remain operational throughout the planning period. However, Dominion says that it will “pause material development activities for North Anna 3,” a third nuclear reactor that the company was planning to construct at its nuclear facility in central Virginia. The IRP notes that Senate Bill 966, which was enacted by General Assembly earlier this year, will become effective on July 1 of this year. This legislation is intended to encourage investments in renewable energy and “grid transformation” projects. The legislation requires Dominion to propose at least $870 million in energy efficiency programs over the next 10 years. Dominion states that it “has begun the initial planning associated with a transformational grid modernization effort.” These “grid transformation” efforts will include investments in smart meter technology, distribution substation automation, “replacing aging infrastructure,” and an “enhanced customer information platform” to allow customers to manage their energy consumption. Although the IRP notes that Senate Bill 966 requires the company to propose $870 million in efficiency programs over the next 10 years, the IRP does not identify what type investments might be made. We expect the SCC will enter an order for notice and hearing in the coming weeks. The SCC’s order will include deadlines for intervention, expert witness testimony submissions, and a date for the evidentiary hearing. If you have any questions about Dominion’s IRP, or other electric energy matters, please contact one of GreenHurlockler’s renewable energy or regulatory lawyers. The Delaware Public Service Commission has established a March 8, 2018 hearing date to consider retail choice enhancements. The enhancements include a purchase of receivables program; “seamless moves” where customers may move within the utility service territory and maintain their supplier; “ instant connects” where customers may sign up with a supplier on their first day of service; an “enroll with your wallet” program where customers may enroll with a supplier without the use of their utility account number or other utility-assigned identifier; improvements to the Commission’s shopping website; and utility bill inserts to promote choice. The proceeding has been pending since the end of 2015 when the Electricity Affordability Committee created by the Delaware General Assembly filed a petition with the Commission. Since that time, the parties have filed written comments and participated in working group meetings. Also, the case was stayed for a period of time while the parties and the Commission finalized amendments to the Delaware Electric Supplier Rules. The case will be heard before a hearing examiner. The primary participants in the case are the Staff of the Commission, Delmarva Power, the Delaware Public Advocate, and the Retail Energy Supply Association (RESA). GreeneHurlocker is representing RESA in the proceeding. For more information, please contact one of our regulatory attorneys. As the 2018 General Assembly heats up, we expect energy issues to be front and center once again. That’s one of the reasons we just published Principles of Electric Utility Regulation in Virginia, a guidebook designed to provide a plain-English explanation of some of the state laws regulating Virginia’s two largest monopoly electric utilities. Do you have questions about the role of the State Corporation Commission in setting rates? Wonder why you’re not getting a refund from your electric utility this year? Curious about whether energy companies are incentivized to invest in clean energy? This booklet answers these questions and provides a starting place for exploring Virginia’s complex regulatory system. We hope this document will be a useful tool for legislators and their staff, the media, and all citizens who want to gain a better understanding of energy policy in Virginia. The link at the top will get you the electronic version immediately. If you would prefer your copy be a printed one, just contact any of our Virginia energy lawyers. Eric Wallace covers the Notice of Proposed Rulemaking (NOPR) sent by Secretary of Energy Rick Perry to the Federal Energy Regulatory Commission (FERC) in regard to grid resiliency. The GreeneHurlocker law firm has just published Principles of Electric Utility Regulation in Virginia, a guidebook designed to provide a plain-English explanation of some of the state laws regulating Virginia’s two largest monopoly electric utilities, explained co-managing member Eric Hurlocker, one of the firm’s energy law attorneys. “The statutes governing Virginia’s electric utilities, found in Title 56 of the Code of Virginia, are extremely complex, but we’ve made our best effort at helping citizens who must do business with and purchase energy from Dominion Energy Virginia and Appalachian Power Company understand the rules in plain English,” said Hurlocker. The guidebook and its glossary of key terms is intended to be a reference tool for those who want to gain a better understanding of utility regulation and energy policy in Virginia. 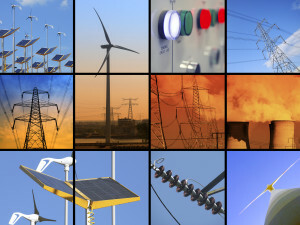 Hurlocker has focused for more than two decades on advising clients in the areas of energy law as well as commercial transactions and general corporate work for energy and technology companies, manufacturers and services providers. After working in large law firms and for utility firms, Hurlocker joined with Brian Greene five years ago to form the GreeneHurlocker firm, which concentrates on work in energy law and for businesses in the energy space. Persons interested in a copy of the guidebook can contact Hurlocker or download the complete guidebook here. Earlier this week Dominion Energy Virginia (“Dominion”) released a request for proposals (“RFP”) for 300 MW of new solar and onshore wind energy. The company is seeking to either sign power purchase agreements or purchase renewable energy projects that are under development. The facilities must be capable of producing power by 2019 or 2020. Dominion released its RFP after announcing that it will offer a new renewable energy tariff (“Schedule RF”), which the company intends to file with the State Corporation Commission in the coming weeks. Schedule RF is intended to serve Facebook, which is building a one million square foot data center in eastern Henrico County, and other large commercial customers. Under the proposed Schedule RF tariff, participating customers would purchase the renewable energy attributes of new facilities that are added to the grid. Notices of intent to bid are due by 5:00PM on October 27, 2017, and responses to the RFP are due on December 1, 2017. The RFP directs bidders to provide their best and final price when providing a proposal. In addition to the price, the RFP document states that Dominion will consider “non-price” criteria when evaluating proposals, including the economic development impacts for Virginia and the financial strength of the firm submitting a bid. For more information about this RFP or the regulations affecting renewable energy development in Virginia, please contact one of our renewable energy lawyers or regulatory attorneys. In this Energy Update, Brian Greene explains how Maryland’s Public Service Commission is soliciting comments on the implementation of supplier consolidated billing. For more information about billing plans and regulation, contact Brian or any of our mid-Atlantic energy lawyers.